I have just recently become aware of an interesting experiment that use a permanent magnet. That enables a ball bearing to be hung suspended from a metal ring and without any apparent reason. 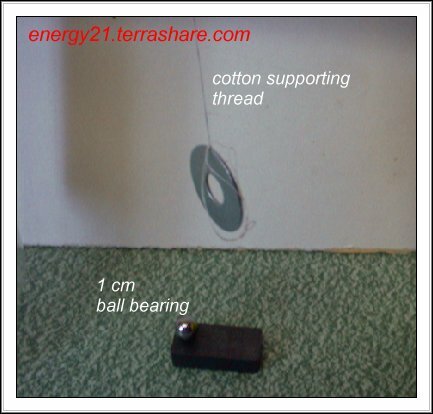 This experiment may indicate a phenomena that could be useful in tapping an external energy source. 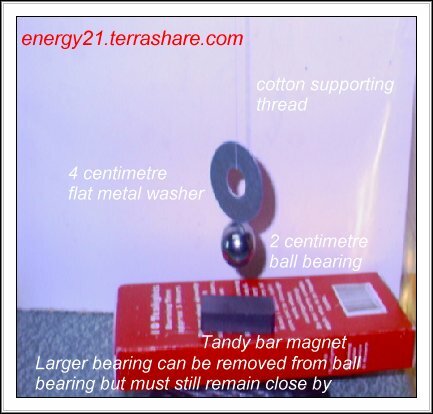 I have been told this experiment could work because of electrostatic forces holding the ball bearing and the washer together,(I personally find this hard to believe but I could be wrong). I am myself toying with the idea that it may be due to atmospheric forces. That is the air at the magnetic joint is forced out, creating a small vacuum at the point of contact between the bearing and washer, which then remains when the magnetic field is removed and the resulting pressure around the rest of the device holds this thing together. For this the resulting vacuum, would then need to be able to hold the weight of the ball bearing,and if the weight is too great the metal bearing would simply drop off. Edward Leedskalnin the guy who built The Coral Castle in Florida using methods, as of yet not fully explained to build the castle complex,some said they were of a hidden electromagnet method he discovered and then kept hidden from those around him at the time. He wrote a small booklet about electrical and magnetic phenomena ( Check out the links below for his observations) unfortunately many to date have found it difficult to comprehend. The experiment he describes in one part of booklet, is similar to the project related on this page which may help to explain the reason for the results obtained so far. The bearing seems to be too heavy for the experiment, and when the magnetic field influence is totally removed, from the set up as illustrated above, the ball will drop off due to the force of gravity. The experiment is carried out as thus. A piece of cotton wool is attached to an upper support, and the other end then is attached to a metal washer as shown in photographs. 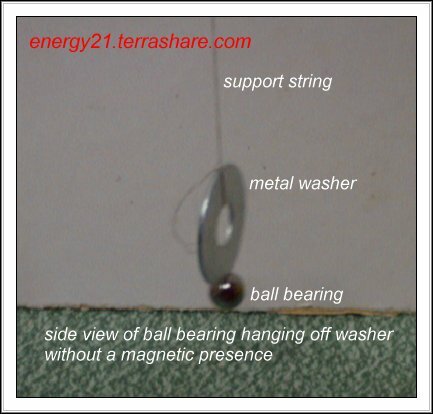 The ball bearing is placed on the top of the magnet, and then bought into contact with the hanging washer. 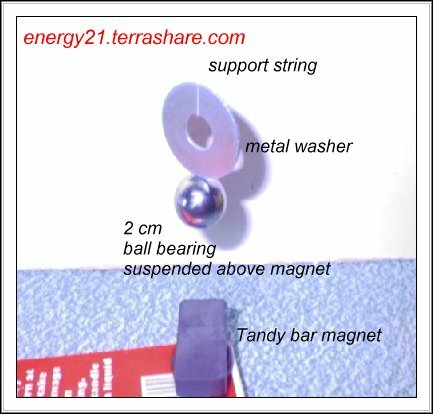 The magnet is then carefully removed and the ball bearing, in this experiment will remain hanging on the washer, but will eventually fall off, if the magnet is removed too far away. 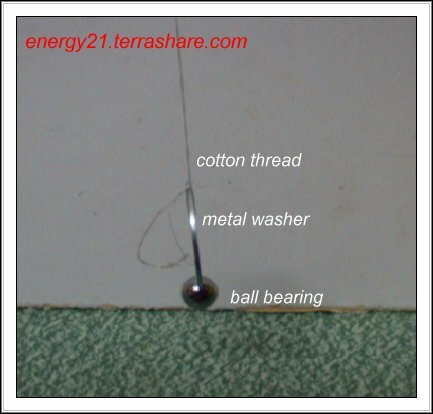 You may find it easier if you do the experiment, by just lifting up the washer and ball bearing and away from the magnet using the cotton thread that is holding the washer. Using a smaller ball bearing I have found it is possible to have the ball bearing remain hanging on the washer, when the magnet has been removed completely from the setup. I have been informed that this joined condition will stay this way,until acted upon by an external force. 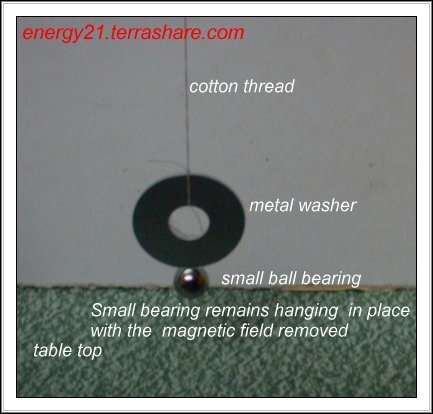 If the metal ball bearing is removed by hand or other force it is impossible to have the ball bearing to re attach itself to the hanging washer unless it is again held in placed wit a strong magnetic field as previously described. The side view of the experiment,the washer and with the ball bearing and washer free to swing in any direction, as dictated by environmental forces. Another view of the same experiment. Another simple experiment to try, is called the David Hamel magnetic spinner. 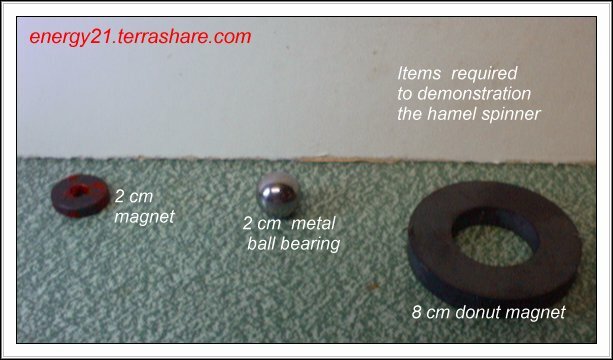 It consist of the three parts as shown above ,that is a small round magnet,a 2cm ball bearing,and larger donut magnet. 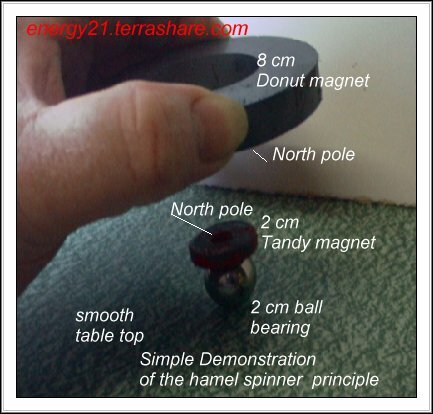 The smaller magnet is placed on top of the ball bearing, and the larger donut magnet is held above the smaller magnet ,(both magnets are in a replusive mode, that is North pole to North pole, or South pole to South pole. With some practice and by slightly tilting and moving the larger magnet by hand, it is possible to make the small magnet below perform an orbital circulating motion. David has used this simple principle to explain how he thinks, he can make a flying disk craft using this simple technique but scaled up. Many people who have seen this experiment performed thought this was experiment itself was a pathway to free energy. This could not be further from the truth as a much more complex device needs to constructed using this simple experiment and the simple principle demonstrated as a guide only. If you are interested in further explanation of the David Hamel device and some constructors trying to build this device, then check out the following web pages for yourself.